REC Group, a leading vertically integrated solar energy company with operational headquarters in Singapore, proudly demonstrates its high-quality solar panels and its vision of solar energy at the 10th Singapore International Energy Week (SIEW). From October 23-27, the SIEW is an annual platform for energy professionals, policymakers and commentators to discuss and share best practices and solutions within the realm of global energy. This year’s key theme “Rethinking Energy; Navigating Change” demonstrates Singapore’s top-level push for a transition to clean energy across the whole Asian continent and beyond. 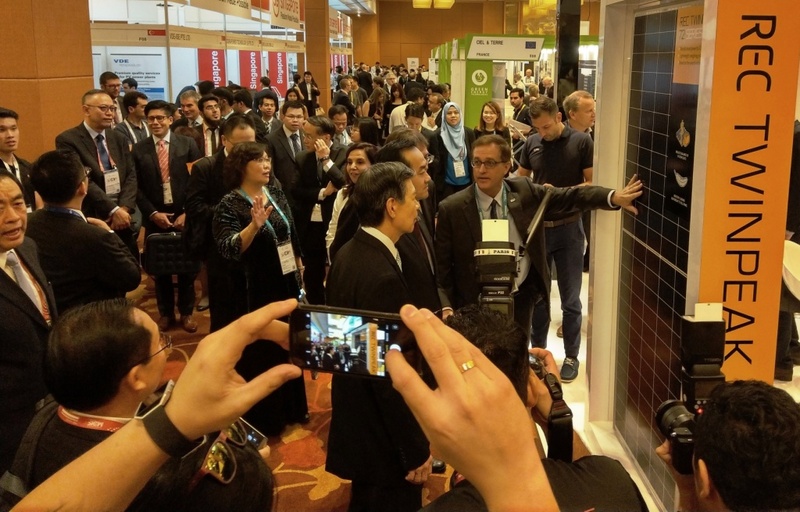 Steve O’Neil (CEO of REC) presenting the REC TwinPeak 2S 72 solar panel to Dr. Koh Poh Koon (Singapore’s Senior Minister of State, Ministry of Trade & Industry) and Mr. Edwin Khew (Chairman at the Sustainable Energy Association of Singapore). The made-in-Singapore panel is the world’s most powerful 72-cell multicrystalline panel. The Asia Clean Energy Summit is a thought-leadership forum during the SIEW and is organized by the Sustainable Energy Association of Singapore (SEAS). The non-government and non-profit business association represents the interests and provides a common platform for companies in renewable energy, energy efficiency, and financial institutions. According to Bloomberg New Energy Finance, solar will make up 27% of all new investments in energy generation assets from 2017 to 2040. In the Asia-Pacific region, this represents around USD 1.6 trillion of investments. Analysts predict that solar will be the world’s most common energy source by 2050, powering 40% of the world’s electricity needs. “We will see solar panels not only at ground level or on rooftops, but also fully integrated into zero-energy buildings, charging our vehicles and even floating on bodies of water. The digitalization of the energy sector will play a crucial role. For energy management, it will allow much more flexible and less vulnerable infrastructures, such as so-called smart grids or virtual power plants at local, national and even international levels,” adds O’Neil. In light of the upcoming UN Climate Change Conference, Cop23, taking place in mid-November in Germany, REC calculations demonstrate the immense potential for solar’s future: Roughly an additional 4,800 GW of new PV installations need to be installed between 2016 and 2025 in addition to the current trend, for solar energy to contribute to closing the emissions gap and thereby limiting the global temperature rise to below 1.5°C. Annual demand of new solar PV installations is forecast to exceed 100 GW before 2018 concludes, with China (around 45% share), the USA (around 12% share) and India (around 10% share) being the largest markets. Other emerging markets in Asia, such as Southeast Asian countries, also see the opportunity to realize solar’s global competitiveness by developing renewable energy sources, and thereby reducing their reliance on both fossil fuel subsidies and fossil fuel imports.